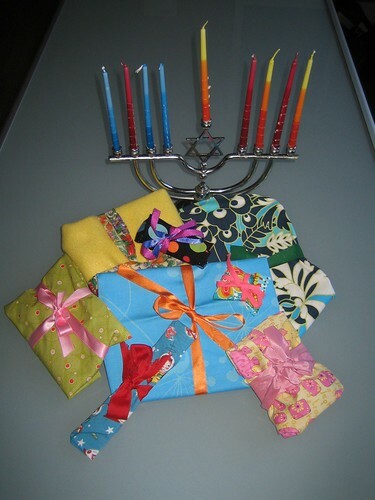 This year, we've decided to do both Chanukah and Christmas. The 8 presents pictured above are all wrapped in scraps of fabric left over from various sewing projects and tied with scraps of ribbon. I literally didn't cut anything — just made it work as is. Of course, if I was giving these to friends I would have fancied them up a bit, but they're just fine for a 4-year-old. I love this way of wrapping for Anna because she can open everything herself (very important to her at this age). No knots, tape, or other impediments to getting at the goodies inside! Great idea, these look great and are perfect for little hands. Reduce, reuse, recycle baby! Enjoy your celebration.